Description: A nice seven unit lashup passes through Jct Switch as the Roseport Local waits in the clear. Description: This Northbound is minutes away from a crew change. Description: Highest railroad bridge in Tennessee, 389 feet above New River. 1963 realignment of "rathole"
Description: Northbound across Tennessee's highest railroad bridge. Description: UP 7651 & 5226 stack train Eastbound at Upsal. Description: A Union Pacific stack train passes by Eckley Pier led by SD70M No. 4131, ES44AC No. 7651, ES44AH No. 8151, and C45ACCTE No. 5287. Description: Union Pacific ES44AC No. 7651 trails on a stack train as it passes Eckley Pier. Description: An eastbound UP ethanol train sits stopped while a westbound UP stack train passes by on its way to Oakland. Leading the empty ethanol train is AC400CW No. 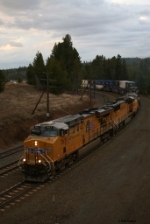 6585 while SD70M No. 4131, ES44AC No. 7651, ES44AH No. 8151, and C45ACCTE No. 5287 all lead the stack train.